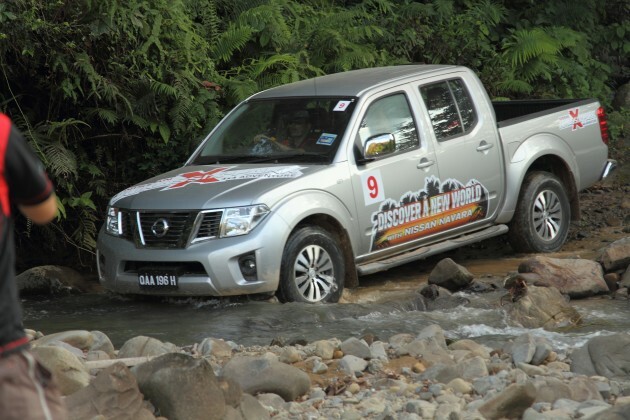 Edaran Tan Chong Motor (ETCM) recently threw the covers off the updated Nissan Navara pick-up truck in Sabah. 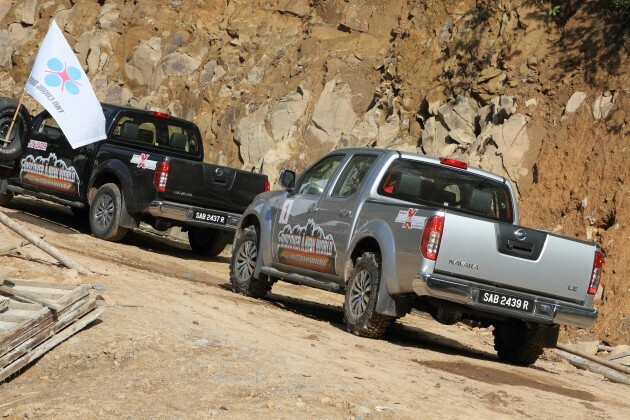 However, only two double-cab variants were deemed popular enough to receive the upgrades, and the chosen ones are the Navara 4WD A/T LE and the 4WD M/T SE versions. This leaves the 4WD M/T Standard, 2WD A/T Calibre and the Navara King Cab 4WD M/T Standard to be updated in the future. The front bumper kicks things off with a more angular design, especially where the fog lamps are housed. The lower intake also looks to have been cleaned up a little, now looking more at home around town than in the jungle. And it does pair well with the new grille – now with chromed vertical slats instead of the old mesh-like design. No longer running with five-spoke wheels, the new alloys features multiple spokes with a two-tone finish wrapped with 255/70 R16 tyres. Hop inside and you’ll definitely notice the six-inch infotainment touch-screen navigator unit. It plays DVD, and supports Bluetooth and USB. The screen also doubles up as a display for the reverse camera. As its name suggest, there is GPS built into the unit that works well in the city but not so much in the dense jungle. It’s not so much of the lack of signal reception – the arrow on screen points to the direction the truck’s heading – but the lack of a proper mapped-out jungle route. The above updates are applied to both variants, but there are diffrences. The LE has the JPJ-compliant xenon with manual levelling headlamps versus halogens in the SE. The automatic LE also gets leather seats, an auto dimming rear view mirror, six speakers, silver-finished centre console and door switch panel, glove box lock and chrome door mirrors. The SE gets fabric seats, four speakers and body coloured door mirrors. The rest of the truck remains the same, right down to its double-layered high-tensile steel frame. There are no changes to the 2.5 litre YD25DDTi diesel, it still produces 174 PS at 4,000 rpm and 403 Nm of torque at 2,000 rpm. The automatic is a five-speed unit, while the manual is a six-speeder. The Navara’s ‘Shift-on-the-Fly’ 4WD gives you more control of the power that gets sent to the wheels as well as the number of wheels that move the truck. You have the choice of 2H, 4H and 4LO. It isn’t the most complicated off-roading system, but it has proven to be just as effective now, as it was then, when I took it for a short crash through the jungle region that fringed Kota Kinabalu. The truck’s tyres did slip on a few occasions, especially when the terrain got slippery, but quickly regained traction when the right drive mode was summoned. With that said, the tyres were not bona fide off-road rubber, hence the low grip. In other cases, where the terrain offered more traction, the Navara can get around with surprising quickness. So, power and torque of the 2.5 litre diesel isn’t something to bemoan. My leg of the convoy did not include driving on tarmac, although our pixman Sherman, who drove most on the road, said that it took more steering to turn the Navara and its suspension is set on the softer side compared to the Ford Ranger. Still, this isn’t a test drive report; far from it. We hope to test the refreshed Navara over a longer period to be sure of its capabilities. 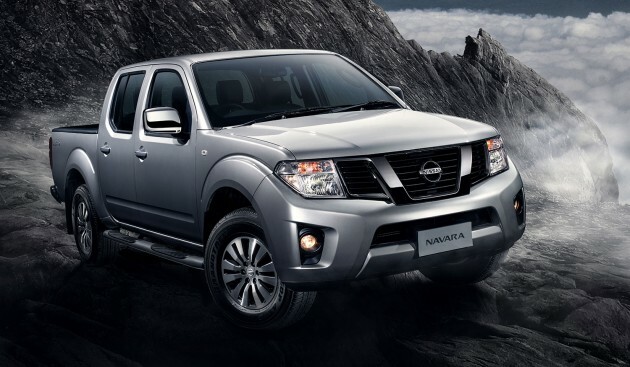 The updated Nissan Navara is available in four colours – Tungsten Silver, Brilliant White, Twilight Grey and Diamond Black. Now available for booking, the on-the-road price for the 4WD M/T SE is RM94,834, while the higher-spec 4WD A/T LE will cost you RM105,834. wah this one is better than hilux lah..
You guys are incorrect. No matter how good the Navara is, it won’t able to catch up the excellence, brilliance, elegance of any generation of Hilux. Even Top Gear Jeremy did prove it! Chevrolet Colorado much-much better and pricing is value for money with the spec and features. In terms of performance and handling is superb. You talk about the Colorado of Duramax 2.8 with 6-speed automatic transmission only? still prefer the previous face though. it’s cleaner and still rather up to date, in terms of design. this new look is too complicated. Tested the other day. To be honest and not to let Nissan down. Shocked my friend and I. It doesn’t feels like 174ps and 407nm. Its very laggy. Press hard on pedal exiting roundabout feels very slow. The sound it really ‘roar’ when it reach 2500rpm. Maybe something wrong to the test drive unit. It feels like hilux 2.5 non vnt. Triton vgt however really powerful. The figures tells the exact power. I suspect the test drive unit is 5-speed automatic. I test drove the 6-speed manual Navara and it is superb. So how a diesel should sound??? ?been driving navara for 3 years now and i can say the sound insulation is quite good for a truck…. Agreed…navara is too wide for offroading but so does the new ford ranger, colorado and dmax..
you are lame. you wanna compare navara to colorado? navara is not only wide but too LOW! colorado has 80cm water wading..now beat that. go do your homework before spitting crap. where exactly in sabah is this? I have no idea, honestly. The convoy got off-road in Kokol Hill and exited someplace that you can view Mt. Kinabalu… if this is any help to you. I believe it is at Alamesra,KK. Next Triton, then Ranger, Dmax, and then Hilux facelift again after that. starting price slightly higher than it competitor but i like the front. Whose have a nissan navara?just ask him what the navara mean..if you doesnt know what navara is it..